Don’t get me wrong. Gustafson’s Farm makes fantastic eggnog—if you’re a pansy. But if you’re in it to win it, making your own eggnog is the only way to go (this coming from a guy who has his mommy make it). Seriously, I’m tired of all the store bought “eggnog” making its way into family holiday pimp cups every holiday season. Come on people—we’re celebrating sweet baby Jesus’ birthday (unless you’re not). This is the one time of the year when you have to pretend to actually have traditions. Besides, you’ll have time off from work, some of you permanently thanks to the economy, and a need to get into the holiday spirit drunk pirate style. Hopefully this helps. Straight from The Nashville Cookbook (1976, 1977), this recipe has it right, all the way down to the egg whites, grated nutmeg and bourbon. Unless your Uncle Bob gets out of rehab, this recipe should serve 8-10, although you might want to up the alcohol content if you plan on getting rowdy. 1. First, heat the milk just until small bubbles form without boiling. 2. Beat the egg yolks with sugar until light and fluffy. Then add salt and the hot milk. Mix well. 3. Place over low heat and cook, while stirring, until mixture thickens (excess heat and long cooking will cause it to curdle). 4. Beat the egg whites until stiff, gradually adding the 1/4 cup sugar. 5. Fold whites into the hot milk mixture. 6. Stir in bourbon or rum. Serve hot with a dash of nutmeg. There you have it. An eggnog tradition even Grandma can get drunk on—not that she needs any coaxing. For all those out there who really don’t like the idea of raw egg whites or aren’t fans(and yeah, I’m a trained baker) beaten egg whites floating amongst the cooked egg(like me)because you can’t guarantee that your eggs are organic or how long they’ve been hanging out at the store before you’ve bought them, leave it out! I’ve made my own nog for years and have treated the eggs like I do when making a custard base(which is all egg nog is), by simply holding back the all the whites, and saving them for another recipe(like mousse), or separating only 1 of the eggs and have 1 whole egg and 3 yolks in with the hot milk. I’ve also beat the yolks together with a tablespoon or 2 of some of the sugar to get them to a thick, creamy light yellow color before adding to the hot milk(use an electric mixer if you don’t have the arm strength). My final suggestion would be to add a teaspoon or two of vanilla extract along with your bourbon. I’ve used a combination of bourbon and rum as well, and if you’re feeling very real feisty, add some cognac too. Thanks. All of them sound great. I like Maker’s a lot, but my all time favorite whiskey is Rebel Yell. So I might do one with each. I just tried my eggnog with Wild Turkey American Honey Bourbon and it was right nice! 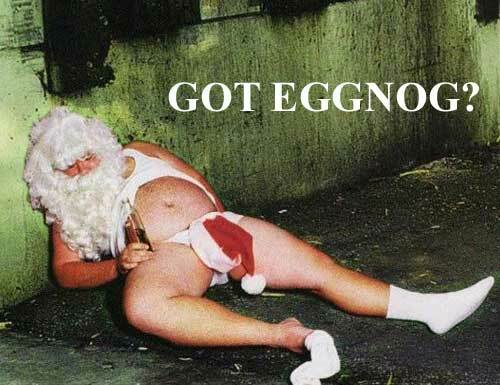 I prefer 100 proof Southern Comfort is the best alcohol to use for eggnog. Jon, I appreciate the comment! Personally, the family uses Maker’s Mark, but we’re not attached to it. I would use whatever your favorite bourbon is and I know a lot people even use spiced rum. Just go with what fits your budget/taste. Thanks for the recipe! What is the best kind of bourbon is best to use in your opinion?